Vacation rental cabin / bungalow. Sleeps 8, 3 bedrooms, 2 bathrooms. No pets allowed. 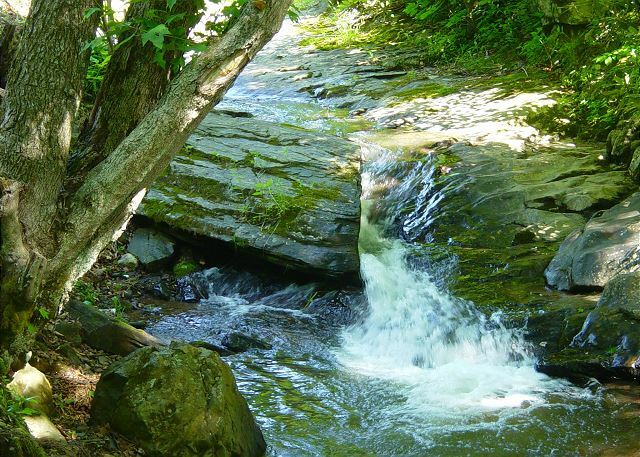 You'll hear the roaring creek from the moment you arrive! 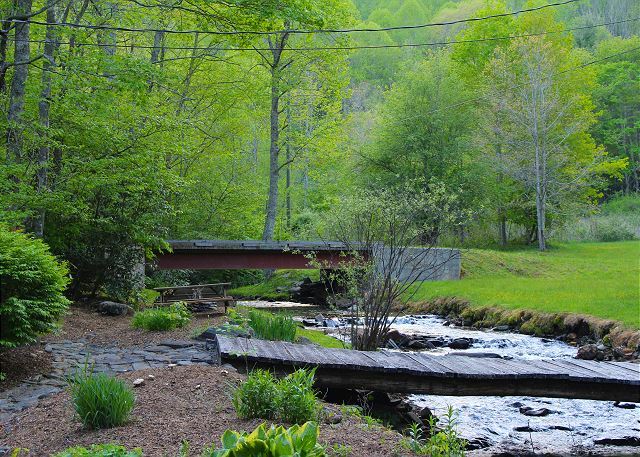 Todd, NC - From the moment you arrive at Roaring Creek, the sound of rushing water and birds chirping will begin to relax you. Enjoy nature at its best at this charming 3 bedroom, 2 bath home that is centrally located to Boone and West Jefferson. On the main level is an open dining, living and kitchen area with beautiful hardwood floors. You will love curling up by the wood-burning fireplace on those cool Carolina Mountain evenings in the comfy leather furniture to watch a movie on the flat-screen TV with satellite. The spacious kitchen is well-equipped for cooking family meals. An air hockey table is located off the kitchen. On the main level is the master suite with queen bed, flat screen TV and private bath. Upstairs is two bedrooms, each with queen beds. 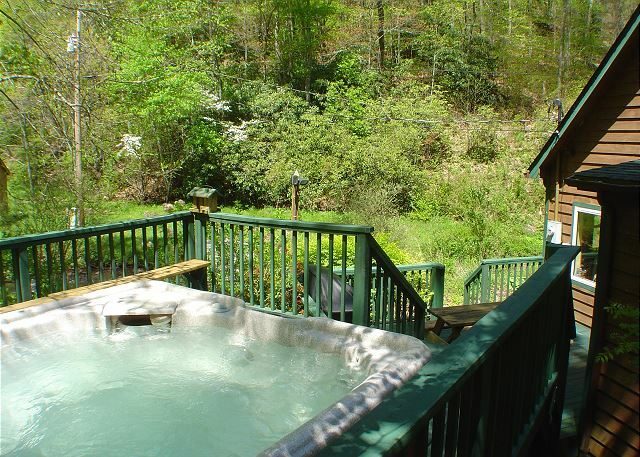 Outside, relax in the bubbling hot tub or sit back and relax by the creek. 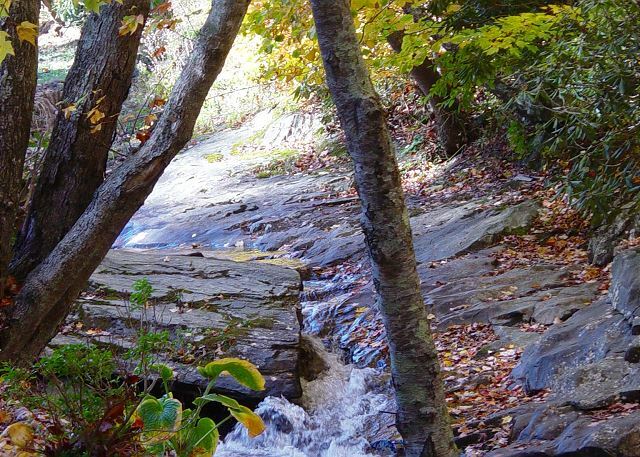 Roaring Creek is a Carolina Mountain Properties & Rentals property. Our calendar and rates are updated instantaneously. Contact us at 800-628-2663 to reserve. We strive to make it as easy as possible to stay at one of our properties. We will notify you proactively when an early check in is possible and you’ll receive the comforts of a luxury home when you arrive with a starter supply of paper products, hand soaps and lotions. In addition, we offer 24/7 emergency after hours service. Carolina Mountain Properties & Rentals uses one of the industry’s most trusted brand of software to securely store all guest data. All of our vacation rentals follow local and state tax rules. Each reservation includes applicable taxes, linen cleaning fee, and a processing fee. Carolina Mountain Properties & Rentals also offers an optional trip interruption insurance to protect your investment. We enjoyed our stay so much here we ended up extending a night! This cabin was very clean and had everything we needed it. We hope to come back soon. We are thrilled to hear that you enjoyed your stay at Roaring Creek. We look forward to having you stay with us. We had a wonderful time on our weekend getaway with friends. We come annually to this area to cut our Christmas tree and this was our first time at the Roaring Creek cabin. When I heard the rushing water from the stream as we pulled into the driveway I got a jolt of excitement over how close it is to the house! The kids loved being that close to the water. It would be a fantastic place to stay in all seasons! I would highly recommend a stay at this cozy cabin! I appreciated the well stocked kitchen so we could cook meals. Thank you for leaving a review of your recent stay at Roaring Creek. 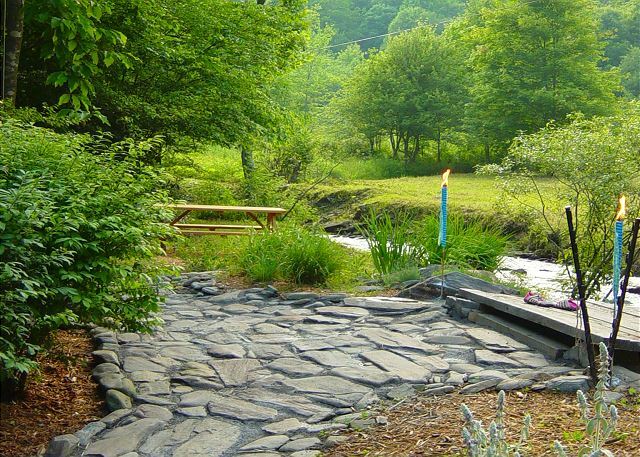 The sounds of creek greets you as soon as you pull in. We look forward to having you stay with us again. Our family rented this property for my daughter's graduation from ASU. We loved the house,the creek and all the grass area. The front porch was my favorite place to just swing and listen to the creek. The house was clean and the kitchen was nicely stocked with everything we needed to prepare meals. The hot tub and fire pit was an added bonus. We are delighted to hear that you enjoyed your recent stay at Roaring Creek. This home has everything you could want. We look forward to having you stay with us again. 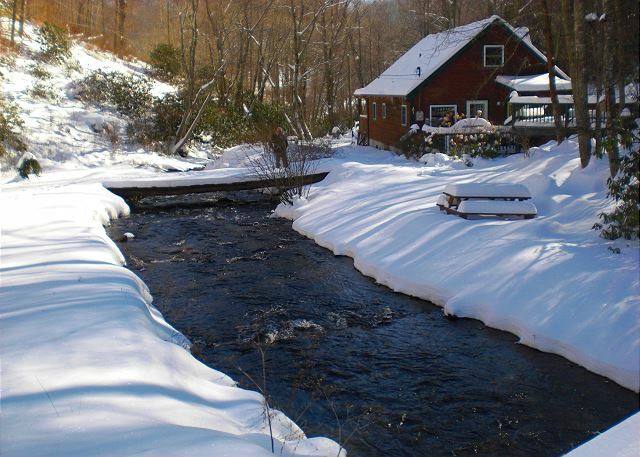 My family (2 adults, 6 children) spent 4 nights over Christmas at Roaring Creek cabin. Our overall experience was great. It was a peaceful trip and we recommend this cabin. The 8 acres allowed our children to roam and explore the rushing creek. The hot tub allowed for much relaxation for all! The chilly night air and sitting in the hot tub was wonderful. The cabin amenities were adequate. Kitchen supplies for cooking, linens and extra throws for cooler weather were helpful. My only complaints would be- master bed is a firm memory foam and both my husband and I were terribly sore after sleeping on it. And the two couches in the living room were not comfortable for relaxing on. Over all we would visit this house again probably in the summer so kids can play more in the creek. Also, there was fantastic trout fishing in downtown Todd just minutes down the road. No fish in the creek by the house which we were lead to believe there was. We hope to return in warmer weather! Thank you for leaving a review of Roaring Creek. 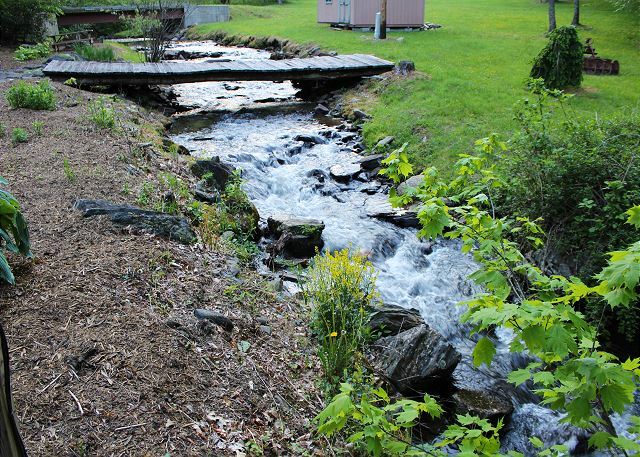 Roaring Creek is on a stocked trout stream. Stocking takes place beginning in April. The owners are exploring replacing the couches in the living area. We are delighted that you enjoyed the hot tub and rushing creek. We look forward to having you stay with us again. Thank you for taking the time to leave a review of Roaring Creek. We are delighted you enjoyed your stay. Very little to criticize. The cabin was accurately represented, clean, cozy, and well-maintained. The directions to the cabin were poor, and should be differentiated as to which direction the guests are coming from. (E.G., From the north..., From the south & west..., from the east..., etc. We came up from the south on Hwy 321 & went way out of our way because the directions said "Do not trust your GPS" but start from Deep Gap (which is almost impossible to find or identify). We could have turned north on Hwy 194 leaving Boone and saved probably 1/2 hour driving. The kitchen supplies, dishes & eating utensils were very nice and ample except for a strange shortage of table knives and spatulas. (Perhaps a previous guest had helped themselves. ??) Overall, it was a very nice experience, and we would definitely stay there again. Thank you for leaving a review of your recent stay at Roaring Creek. We do provide directions starting from the intersection of Hwy 221/421 in Deep Gap. Had you asked for alternate directions we would have been more than happy to provide them. We will be providing more knives and spatulas. Thank you for leaving a review of Roaring Creek. We look forward to having you stay with us. We enjoyed our stay at Roaring Creek. The cabin was perfect for our families needs. We enjoyed the hot tub and the fire pit and having the sound of the creek right next to all of it was perfect. Would highly recommend! We are delighted to hear that you enjoyed your stay at Roaring Creek. We look forward to having you stay with us again. The house and property were just what we were looking for. Very peaceful and located perfectly for our planned day trips. Make sure you bring everything you need for cooking because the store is 25 min away and there is nothing in the house. Also note there is no ice maker so you may want to bring some extra ice trays. We loved the firepit at night and there was plenty of wood. You may want to bring some camp chairs instead of sitting at the picnic table. The creek really made this perfect for us. We all had a great time. Thank you for leaving a review of your recent stay at Roaring Creek. We do not leave anything edible in the house. Cooking utensils, pots and pans, plates, and utensils are provided. We look forward to having you stay with us again. We had a wonderful time at Roaring Creek. 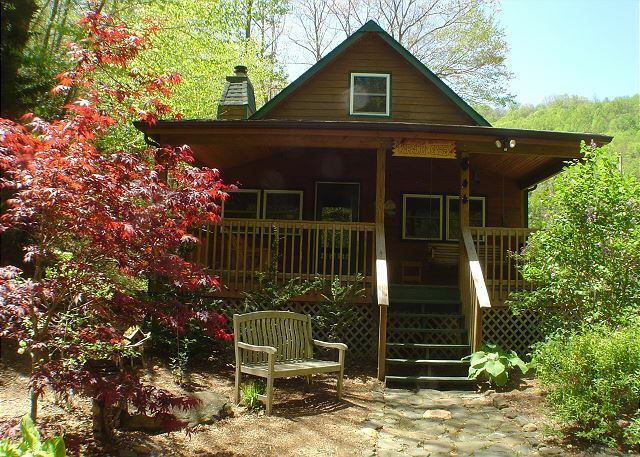 It was the perfect size for 3 couples looking to escape to a quiet and relaxing cabin in the NC mountains near West Jefferson. We were able to spend a lot of time out on the roomy front porch as well as some time near the fire pit out back. 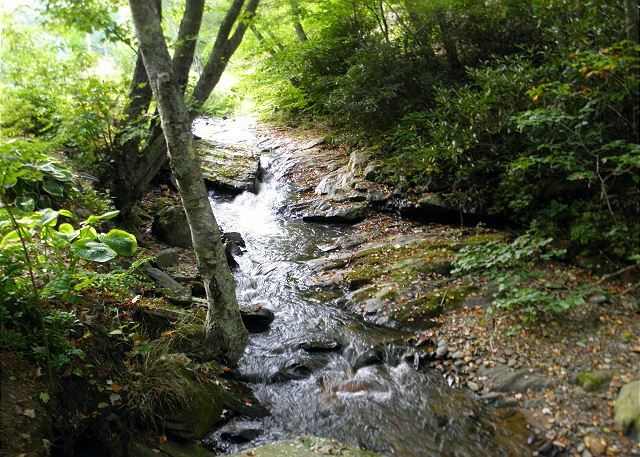 You could hear the "roaring creek" perfectly from everywhere on the property! It takes about 20 minutes to get to downtown West Jefferson or the grocery store. Other than that, it had everything we needed to make the most of our vacation time. We are delighted you enjoyed your recent stay at Roaring Creek. 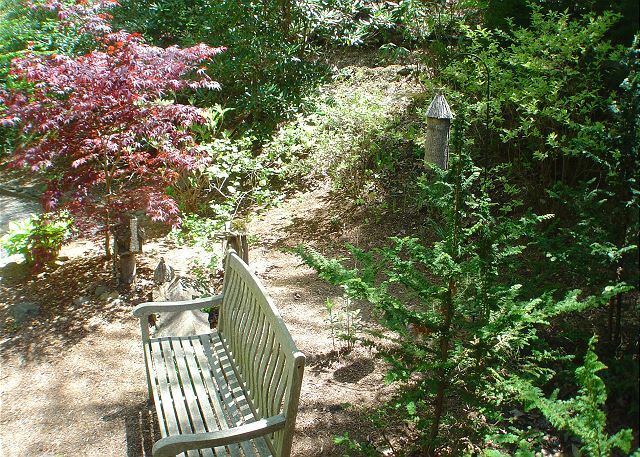 This is a great place to escape and enjoy the peace and quiet. We look forward to having you stay with us again. 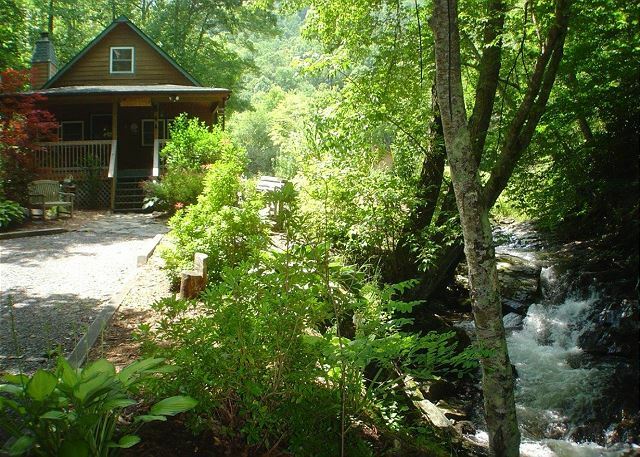 This is everything you want in a streamside cabin. My sister and I booked Roaring Creek for a long get-away weekend. My bottom line is I need to be near running water, and hers is a hot tub. Well, of course this met those expectations. But it went far beyond. 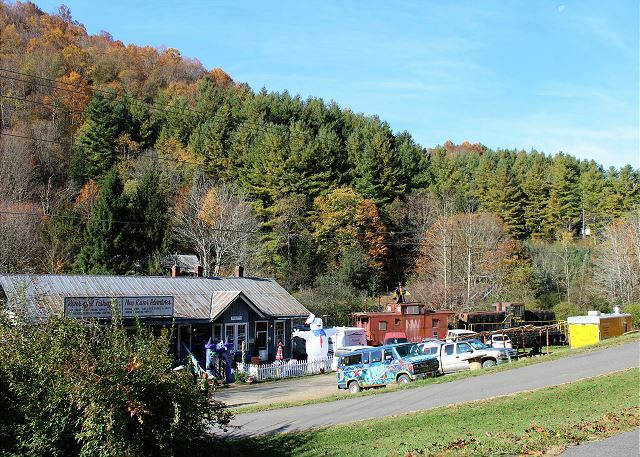 First, the cabin is very close to historic Todd and the Railroad Grade Road in Ashe County, one of the most beautiful places in the world. Forests, small farms, tiny towns, country stores, curvy mountain roads. It's just a lovely area. Second the cabin is a convenient enough drive to either Boone of West Jefferson. The location is magical. In a lovely cove that is both forested, and has an open grassy meadow, so you get that in the woods, by the meadow experience. 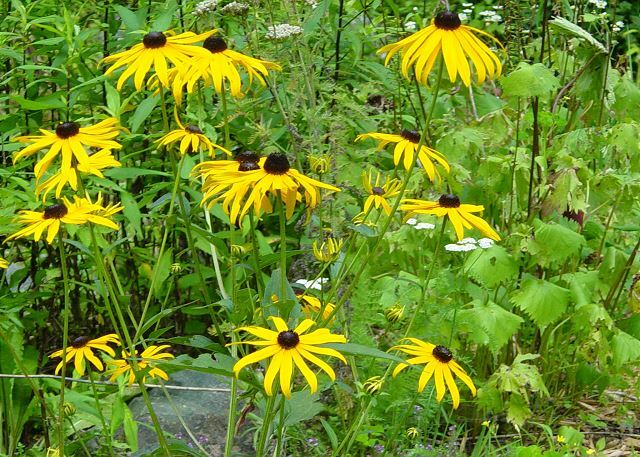 The exterior has a beautifully landscaped garden along the cabin and stream, so you have both the beauty of nature plus the loveliness of a cultivated garden. This is the best stream I've every cabined beside! It is clear, clean, cool, and pretty as can be. Excellent for wading, and exploring. Not too deep or fast for little kids to enjoy. The cabin, inside is well appointed, fresh, and new. Construction is nice and solid and attractive, the furnishings are clean, comfy and in great condition. The decor is a elegant, restrained country effect. Woodsy decorations, but you're not overwhelmed by kitchy decoration everywhere. Beds comfortable and clean, and linens all abundant and in great condition. The kitchen is one of the larger and better equipped of such kitchens I've stayed in, and you could certainly prepare a family meal there. The gas grill is available, but we didn't use it. There's a great firepit next to the stream, and a very generous woodpile to supply it. The managers gave good directions for getting there, although you have to watch carefully for the driveway, it's a gravel road, not the paved driveway into the neighborhood immediately next door. Efficient and respectful service by the managers/bookers. I not only would recommend, I plan to come back myself soon. Thank you for taking the time to leave a review of Roaring Creek. We are so happy that you enjoyed your recent stay. A vacation home we have been enjoying for many years now, no other place comes close to everything Roaring Creek has to offer. So thrilled to hear that you enjoyed another stay at Roaring Creek! We are delighted that you enjoyed your recent stay at Roaring Creek. We look forward to having you stay with us again. We love it! private and cozy, home away from home. 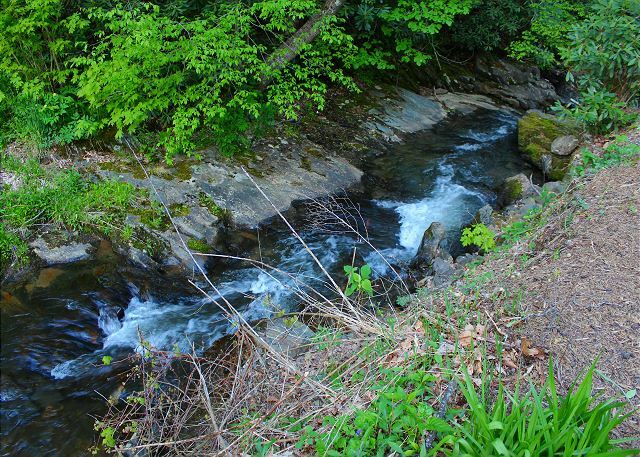 Roaring Creek was nestled nicely in a little hollow with a tranquil stream right next to the cabin. Its nice not to have another home right on top of you.The cabin was clean and tidy. The master has its own bathroom but the two upstairs rooms have to use a downstairs shower and toilet right off the kitchen . Six people is probably all you want to have. the outdoor Jacuzzi was in good working order.The grill had two propane tanks both empty.....I called and the rental agency lady said, I had to get the refill myself they where a small company....they would reimburse me. That threw a wrench in our plans for grilling out. The fireplace inside the cabin needs to be fixed the flu either needs to be cleaned or was installed wrong the wind would blow down the flu blowing ashes all over the living room. We had to stop using it. We had a great stay. Only a couple small complaints. Air hockey table is broken on one end. 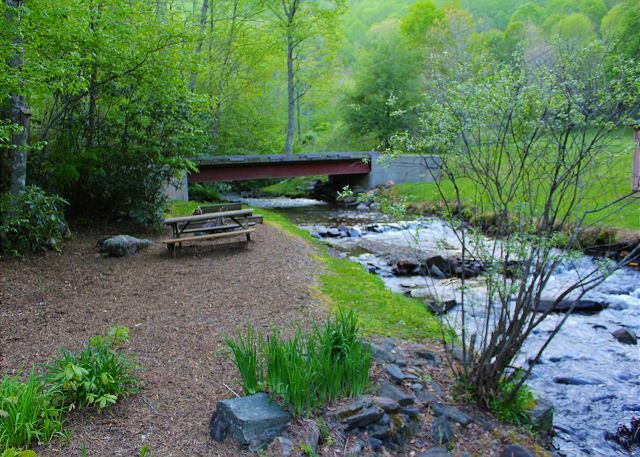 The creek and picnic area was awesome! Great location for leaving the busy life behind. 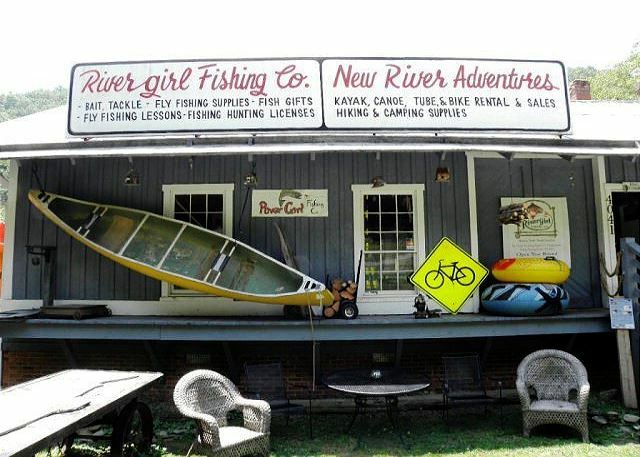 Yes, Roaring Creek is a great location for getting away. We will check on the air hockey table and get it repaired. We hope you will come back and stay with us again. This cabin was amazing and very private. Our family absolutely loved everything about it and the property. Beautiful and peaceful! Loved the creek sounds that could be heard all of the time! Very well stocked in kitchen and with linens. The cabin was spotless and cozy. We built a fire every evening. We will certainly be back to this slice of heaven! GREAT TIME IN THE CREEK! 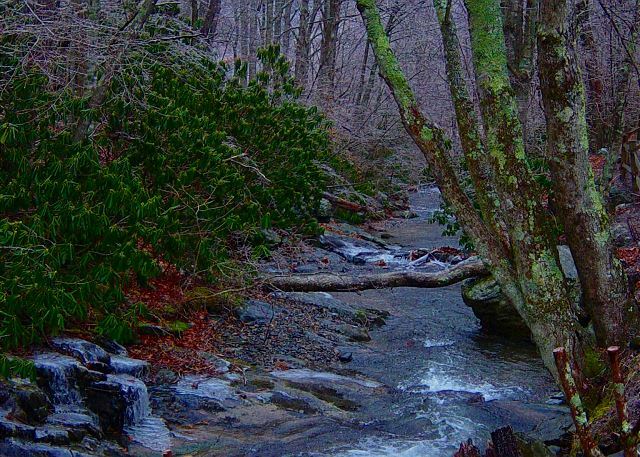 Roaring Creek is very remote and private. Beautiful setting! My son and my mother and I spent the weekend placing rocks in the creek to dam up water in spots. Son almost caught a nice trout. Had a fire in the fire pit next to the creek too. Hot tub was nice. Cabin was clean and cozy. An acre of lawn was perfect for frisbee, flying a drone or RC plane, and other such activities. Would like to return when there is a good chance for snow. Loved the creek & the hot tub, the house was in great shape and ready for us. Everyone at Carolina Mountain Properties was so nice and easy to work with. Thank You . This cabin is great if you want to getaway from a stressful livestyle & relax it is private,secluded and the sound of the water is so relaxing,The kitchen is well stocked with everything you need to prepare meals.I would recommend this Hidden Gem (Cabin ) to anyone. Loved the home it's beautiful, we had such a fun relaxing time, we rented through Carolina Mountain Property, Jennifer Gunn found us the perfect place and we just walked in on a Friday afternoon and she helped us with the perfect place. Enjoyed staying in this beautiful cabin.well stocked, very clean, woke up to snow on the morning we stayed. Will be returning again. Thank you for leaving a review of your stay at Roaring Creek. The cabin is beautiful during a snowfall and easily accessible. We couldn't have asked for a more magical place to stay! Truly breathtaking to be right on the creek and LOVED the hot tub out back! We found the sweet retreat to be just enough space and a fun place to relax and escape normal life. Looking forward to going back! 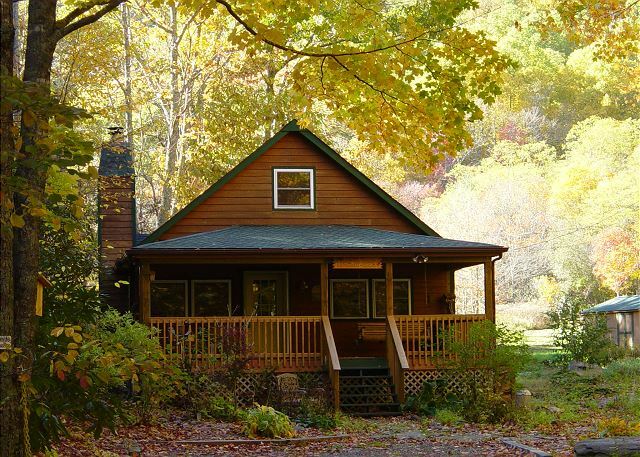 Roaring Creek is a wonderful cabin on the banks of a creek. We are so happy that you enjoyed your stay. We look forward to having you stay with us again. Before we went on our vacation we decided that we weren't going to go any where. And when w got there we didn't need to, have to or want to. It was calming and quiet. We we're amazed that the drive way was so long past our house. The only thing we complained about was the bathroom situation. We didn't know the 2 bedrooms upstairs had to use the bathroom downstairs in the kitchen. Thank you for taking the time to review your stay at Roaring Creek. We are thrilled to hear that you enjoyed your stay. - Cookware could have been better - the large skillet has seen better days. - a half bath upstairs would have been nice - it's a long walk in the middle of night to the downstairs loo. - Direction for opening the fireplace damper should be re-written. Damper lever is on the front of the fire screen, not inside the fireplace. -Otherwise, all was great - would stay there again. Thank you for leaving your review of Roaring Creek. We will inspect the cookware and replace if needed. Also, we will examine the directions for the damper. We look forward to having you stay with us again in the future. We absolutely loved the place! 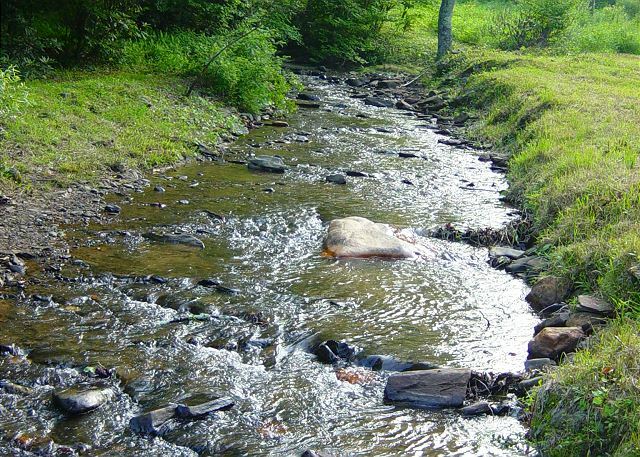 The creek was so relaxing, the property and the location was exactly what we wanted!! The cabin was very clean and that means a lot to us! Who cleans. I think Brenda got a tip from us!! We will be back! Our kids really loved the creek!! This home is wonderful! Beautiful and wonderful decorated. We went to Todd to Kayak. The river was a little low and too rocky, but this home was perfect! 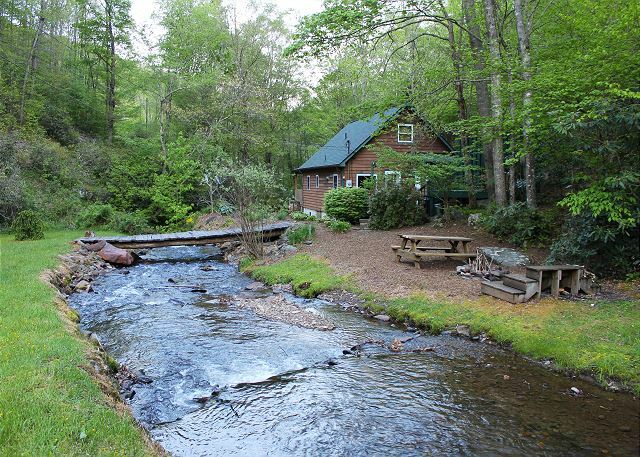 The roaring creek beside of this home is amazing! Thank you for letting us stay! Our Family has rented this place 5 times through the last few years. Excellent location and not to far from town but far enough to get a true feel of the mountains. This trip great as always but the stove right side burners were not working. The grill needs new burners or just needs replacing. The hot tube had alot of sand in it and the jets seemed very weak compared to past visits. I noticed a few of the jet nozzles were missing and could be the problem.Overall a relaxing place and these issues are easily reparable and need to be brought to the owners attention. Still will be my favorite place and we will return. This cabin was a pleasant surprise. It was so CLEAN, then when you go around to the back, there's a HUGE yard. The boys had a lot of fun throwing the football. 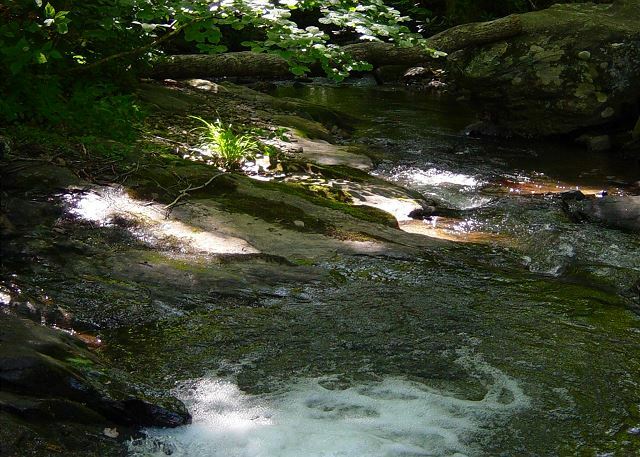 There are woods to explore, the creek really is wide and so much fun for the kids to play in. Inside the cabin was comfortable and there was enough room for everyone. We WILL be staying here again. We do wish it was closer to Boone, but it was so nice that we ended up staying in most of the time anyway. We really enjoyed our stay at this cute cabin! It has WiFi and a fully stocked kitchen. It was great to relax on the porch swing and listen to the creek! It is the perfect place for rest and relaxation! I would recommend going about 5 miles past the turnoff to 221 to buy groceries at the Food Lion on 421 because there is nowhere to get supplies between 421 and the cabin. Wonderful location, great house, quiet, restful, and well equipped. If you want to enjoy a retreat away from the noise and congestion of town this is the place to go. Wonderful creek, beautiful meadow, and even cows nearby. Always an outstanding experience at Roaring Creek. We stayed a week and half and could have stayed longer. Have already booked return visit in a few months. Rained both days that we were there; however, it was such a great relaxing time! Loved the cabin, everything was there that we needed. It was clean, very well laid out, and we hated to leave! Copyright © 2013-2015 Carolina Mountain Properties & Rentals, Inc. North Carolina Web Design by AppNet.com.